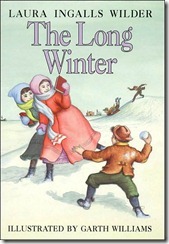 Posted on February 26, 2015 by Barbara H.
The Long Winter by Laura Ingalls Wilder starts out in the summer. The Ingalls family has lived in their little claim shanty through the spring, and Pa is cutting down hay. When Pa comes across a big muskrat house made bigger and thicker than he has ever seen, he takes that as a sign that this coming winter will be a particularly hard one. An early blizzard in October and an Indian’s prediction convinces Pa and other homesteaders that they need to move into town for the winter. Pa had built a building in town in the last book and rented it out. The claim shanty was too flimsy to stand up against a blizzard, and being in town would keep them close to supplies. But then blizzards start coming one right after another with only a day or so in-between, some times only half a day. Supplies run out and the trains can’t get through. Almanzo comes up with a plan, but it is a dangerous long shot. This book isn’t a fun read, but it is a good one mainly to see the ingenuity and character of the family in this crisis. But there are a few lighter moments. When the family moves to town, Laura and Carrie have to go to school: they’re frightened at first (though Laura tries not to show it), but eventually they make friends and enjoy their studies. There is still a lot of singing in the evenings, along with other ways of entertaining themselves. There are also glimpses of the times and culture. When Laura wants to help hard-working Pa to get the hay in, Ma was reluctant. “She did not like to see women working in the fields. Only foreigners did that. Ma and her girls were Americans, above doing men’s work.” But Pa could use the help, so she agreed. I was amused that Ma thought girls “above doing men’s work,” when usually we see “women’s work” demeaned. (And there is a bit of that as well – Almanzo considers cooking women’s work, but since he and his brother are bachelors and have to eat, he pitches in. Maybe each gender thought they had the best of it, though they all were industrious and hard-working). I was interested to read Almanzo’s justification for lying about his age in order to stake a claim. The land agent evidently got that he was underage, yet winked at him and gave him the necessary papers. I did have to smile when he commented once that “Three o’clock winter mornings was the only time that he was not glad to be free and independent” when he had to rouse himself up to do something, when at home his father would do that. Ma’s sending ginger water out when Pa and Laura are working in the hot sun on the hay makes me wonder if the recipe is in the Little House cookbook – it sure sounds refreshing. I’ve mentioned before Ma’s not politically incorrect feelings towards Indians, one of her few flaws grown primarily from fear. It is mentioned in passing again here. Laura has an interesting conversation with Pa when she asks how the muskrats know about the coming winter, and Pa replies that God tells them. Laura asks why God didn’t tell people, and that leads into free will, independence, the differences in the way God deals with animals and people (he could have said, but didn’t, that one way God did give clues to people was through observation of things like muskrat houses). I like that Laura is honest about her feelings and faults. “Sewing made Laura feel like flying to pieces. She wanted to scream. The back of her neck ached and the thread twisted and knotted. She had to pick out almost as many stitches as she put in.” She and Mary quarrel some times and she flies off the handle sometimes, but family discipline is such that she does this less often than one might expect. When the train can’t get through, they reason, “We survived without trains before.” Thankfully both Pa and Ma come up with some old tricks to help along the way. But as dependent as I am on electricity modern appliances, and creature comforts, I agree that I would have a hard time surviving in that setting. A lot of this book is about endurance, and that might not be fun reading for some, but it is important. I think for most of us, our endurance would have run out long before theirs did, and we see some cracks in their armor due to the strain of constant storms, being trapped inside, dwindling food, and monotonous tasks just to keep alive. One of the first times I read this book, it made me quite ashamed that I feel tired of winter and gloomy about the lack of warmth, sunlight, and color – and I have always lived in the southeast, where, though we do have freezing temperatures and bad winter weather, it’s not nearly as bad as what others have to face. As it happened, the several days that I was reading this story this time, we had some of our severest winter weather, and while reading this story reminded me that I have nothing to complain about, in some ways it oddly did add to that feeling of winter weariness. But there is always hope that spring will indeed come again. This entry was posted in Books and tagged Books, children's fiction, laura ingalls wilder, Laura Ingalls Wilder Reading Challenge by Barbara H.. Bookmark the permalink. I think it should be forbidden reading in the winter! We read it for school one winter and it was sooooooooo cold. Reading about the cold wasn’t fun! ;). I heard or read that they sold out all they had printed. I was going to try to read it this month, too. It was originally supposed to get here this week but I got a notice it will be delayed several more weeks. Neat article and photo! Thanks. Barbara, this is actually the only Laura Ingalls Wilder book that I own and I’ve read it many times. I can’t imagine living like that and being as cold as it was for them. We take so much for granted. I think my favorite part is when the train finally gets through and they receive the big barrel with all the gifts and everything. Thank you for the review. Persevering through life-threatening times. Such a good reminder for us when we complain about the little things. I actually have the Little House Cookbook checked out of the library, and the recipe for ginger water is in it! It’s an ancestor of modern ginger ale and was prepared for farmers when it was hot and they were harvesting. It has brown sugar, powdered ginger, cider vinegar, and of course, water. It has similar properties to sport drinks today. Very interesting! I agree that this is a book about endurance and it IS an important read. I was planning to read this title this year but then we had such a mild winter that I wasn’t sure the kids would really “get it.” Plus I was avoiding Farmer Boy as that’s never been my favorite. But! Given the mild winter, I decided to go ahead and switch to FB which my boys, in particular, have been LOVING. I’m glad I went with this title (and I’m enjoying it more this time around) and we’ll save The Long Winter for next year when maybe we’ll have a winter out here on the West Coast!